This a guest post. Words and photos by Jeremiah Sandler. These notes do not discuss either anatomy or medicinal uses of Equisetum. Both topics are worthy of their own discourse. Plants in the genus Equisetum can be found on each continent of our planet, except for Antarctica. The plants are collectively referred to as scouring rush or horsetail. Equisetum is in the division of plants called Pteridophytes, which contains all of the ferns and fern-allies (lycopods, whisk ferns, etc.) Pteridophytes are characterized by having a vascular system and by reproducing with spores, rather than seeds. 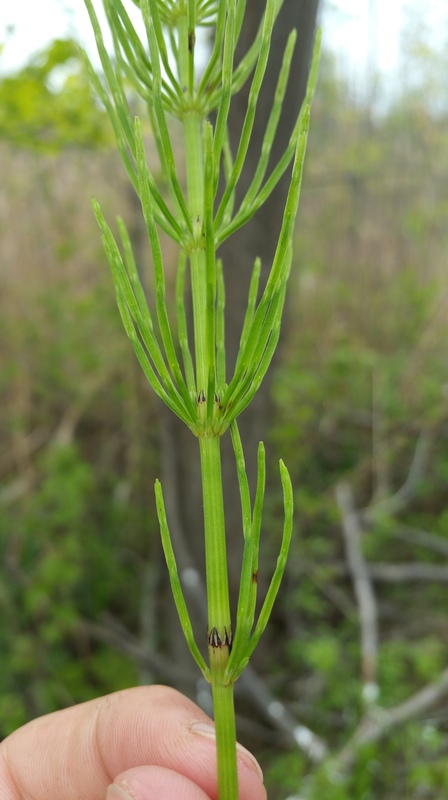 Equisetum is the only living genus within the entire class Equisetopsida. 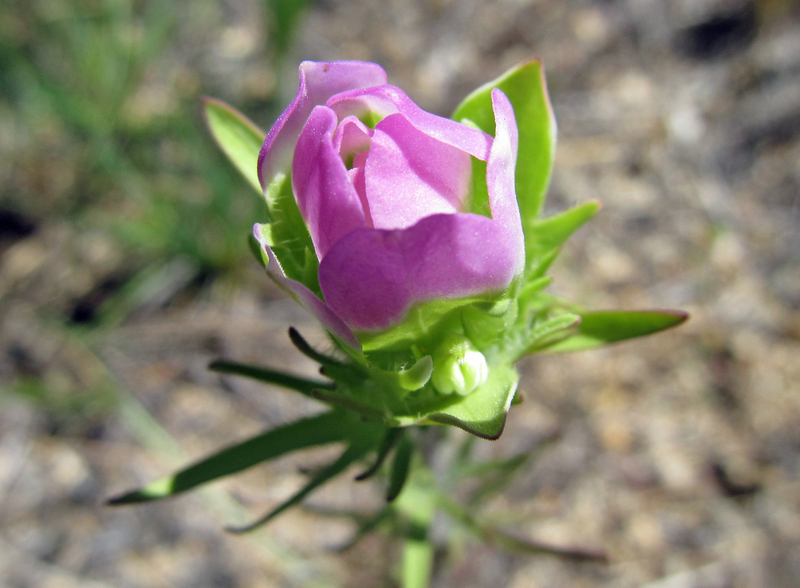 Within this single genus, there are a mere 20 species. Equisetums can live pretty much anywhere. 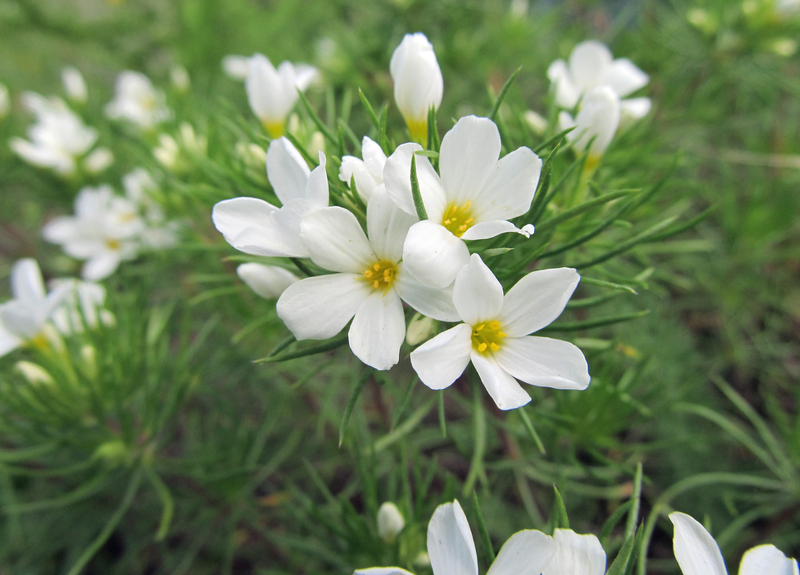 They can tolerate lots of shade, lots of sun, and virtually any soil condition (including submerged soil). 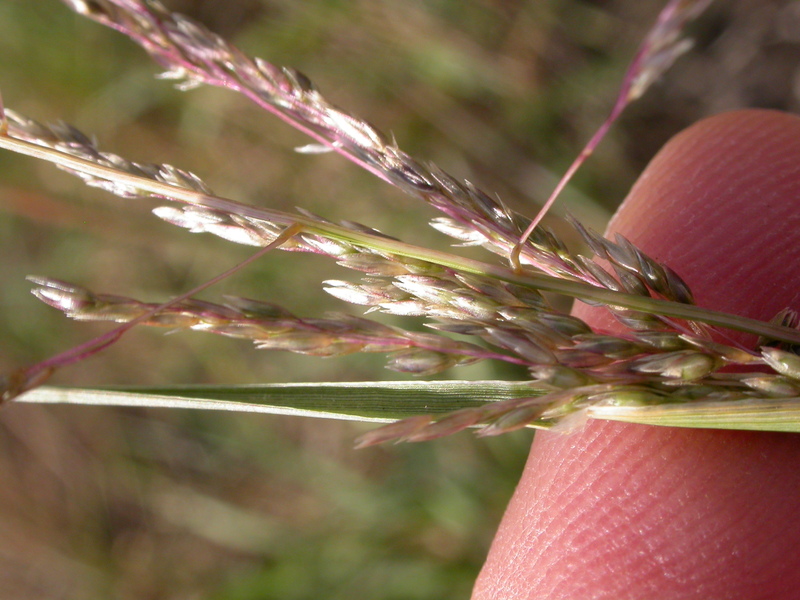 Rhizomatous stems make it difficult for either disease or insects to kill an entire population. They do not require pollinators because they reproduce with spores. Sounds like a recipe for reproductive and evolutionary success. Yet with all of these traits working in their favor, there is only a single genus left. 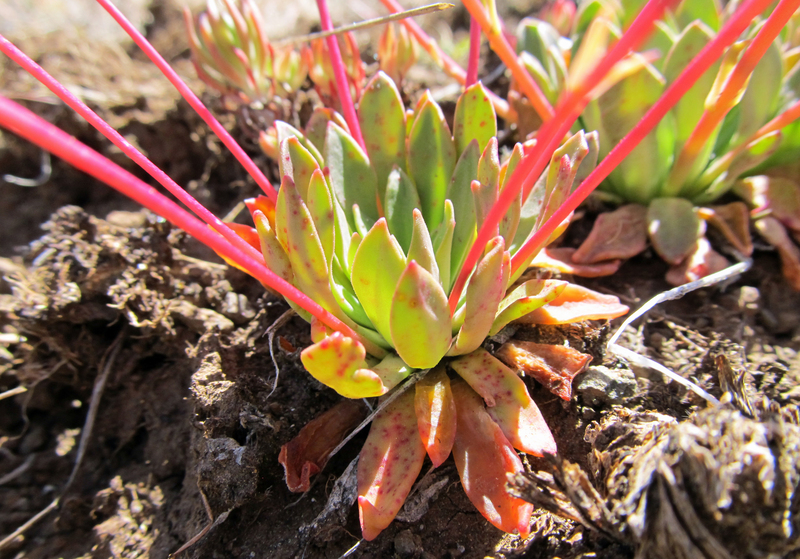 Let’s briefly consider the origin of these plants first. In the late Paleozoic Era, during the end of the Cambrian Period, these plants began their takeover. Shortly thereafter (about 70 million years later), in the Devonian Period, land plants began to develop a tree-like habit, also called “arborescence.” Tree-sized ferns and fern-allies ruled the planet. They formed the ancient forests. The elements required for photosynthesis were plentiful. The planet was warm. Competition from the Cambrian Explosion of flora and fauna drove plants upwards towards the sky. 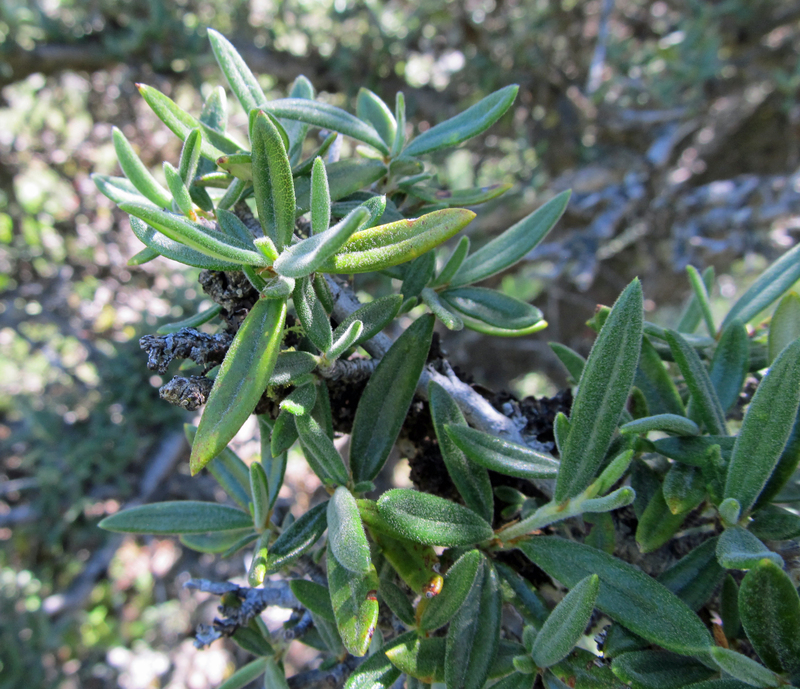 Larger plants can both shade their competition and remain out of reach of herbivores. 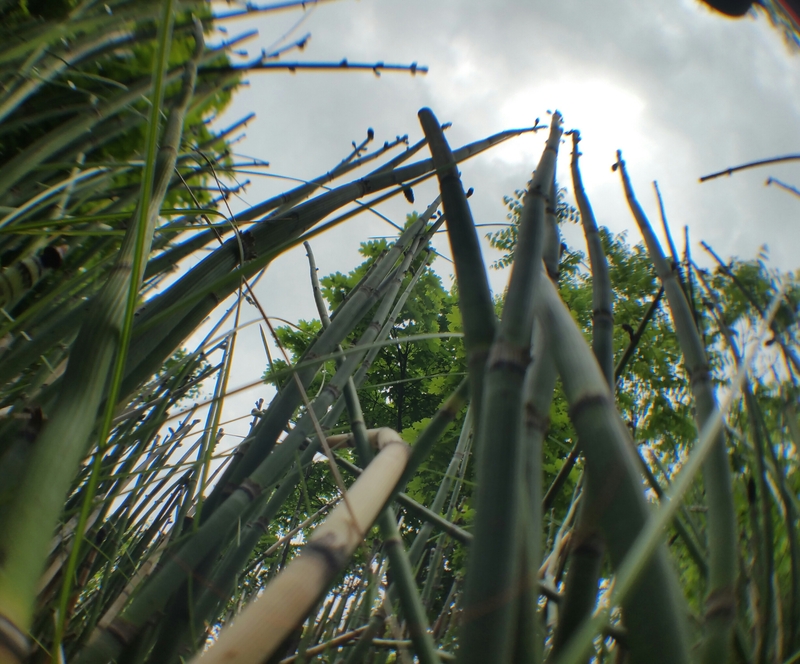 None of the Equisetum species alive today are near their ancestors’ height. It is rather obvious why we don’t see as many Equisetum species, and why they are not as large: The planet now is not the same planet it once was. Oxygen levels back in those times were about 15% higher than today’s levels. Seed plants can diversify much faster than non-seed-bearing plants; Equisetum cannot compete with the rate of diversification of seed-bearing plants. The most interesting predicament comes when Equisetum is compared with other Pteridophytes. 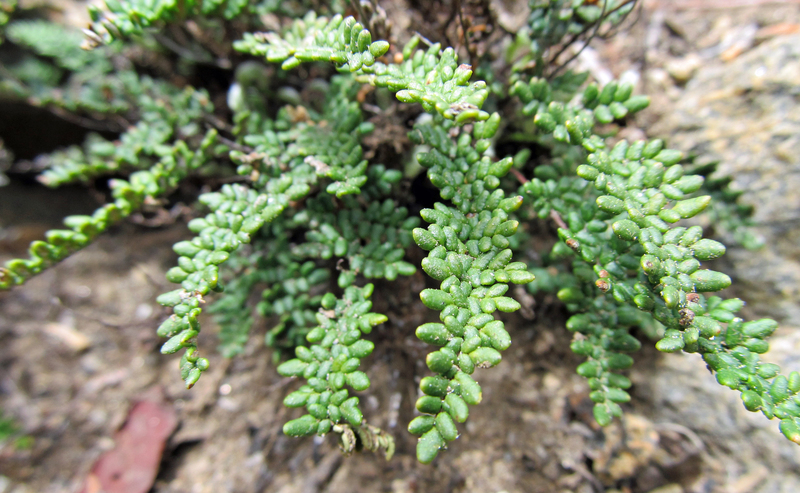 Some ancient Pteridophytes still do have diversity of genera. True Ferns, as they’re called, are broad-leaved ferns. In the class Filicopsida, there are 4 orders of True Ferns containing about 100 genera combined. 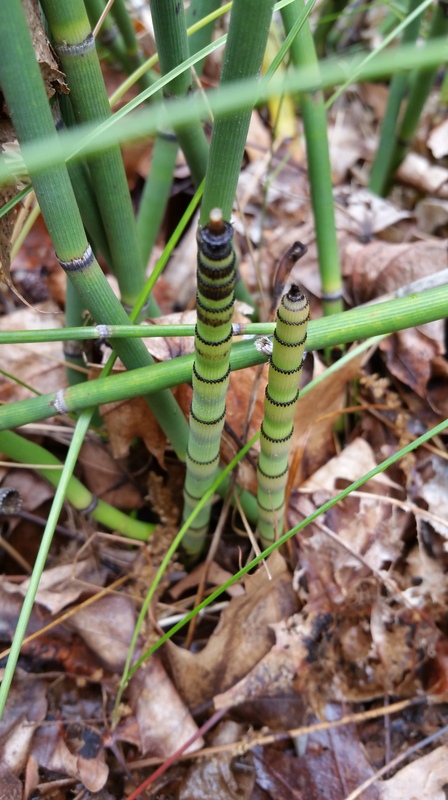 Equisetum has 1 order and 1 genera. What’s the primary difference between these two classes of Pteridophytes? Broad leaves. Most pteridophytes tolerate some shade; most other plants can’t tolerate as deep of shade as ferns. More specifically, the amount of shade the plants create could be a deciding factor in this question. True ferns have all of the traits equisetums have, with one additional physical trait that has pulled them ahead: Broad leaves allow true ferns to actively shade out local competition while creating more habitat for themselves. Equisetums don’t have this aggressive capacity. Of course there are other biological and evolutionary pressures affecting equisetums beside their lack of broad leaves. The structure they do possess has benefited them at a time when it was advantageous to have it. Otherwise why would it exist? Equisetums remind me of the dynamic nature of a planet. I don’t anticipate equisetums coming back. Although, I find it entertaining to humor the idea that they might return to their former glory. The planet’s climate could change toward any direction (I’m not a climatologist, though). Maybe equisetums are adequately prepared to adapt to whatever changes come – or maybe we are observing the gradual decline of an old branch on the tree of life. This is a guest post. Words and illustration by Mesquite Cervino. 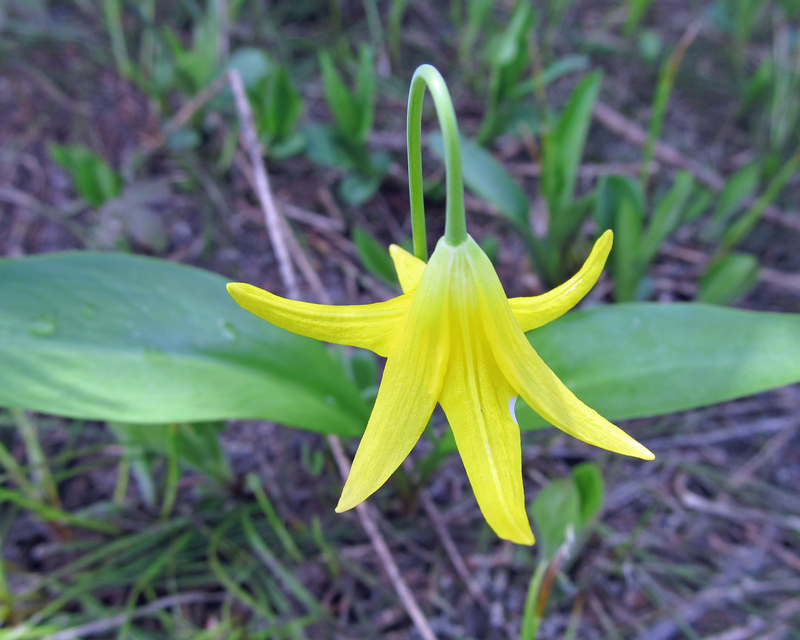 At the end of a residential neighborhood that is barely off the 205 in the hills of West Linn, Oregon is a small, 26 acre preserve called the Camassia Natural Area. The defining features of the landscape were caused by the Missoula Floods (aka the Spokane or Bretz floods) at the end of the last ice age (12 to 19 thousand years ago) which swept away the already established soil and in their place deposited glacial erratics from other far-away places, some even coming all the way from Canada. The flood reached eastern Oregon and the Willamette via the Columbia River Gorge and created the green and rocky plateau that is now Camassia. 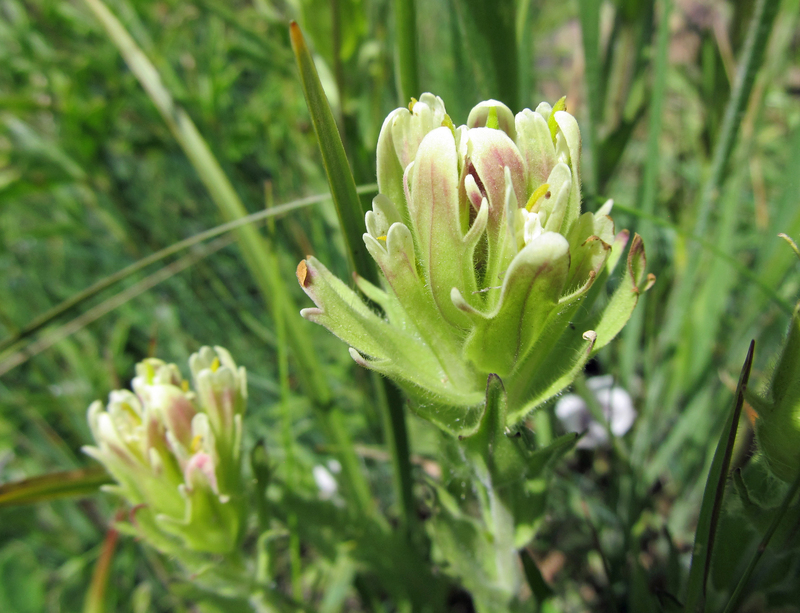 While the reserve is named after a widespread plant in the park, which is a common camas (Camassia quamash) that blooms in April and early May, the park has over 300 different species overall. However, one species in particular has kicked in the door and far overstayed its welcome in the park, becoming a highly invasive weed in the area. This plant is known as Lapsana communis or nipplewort. 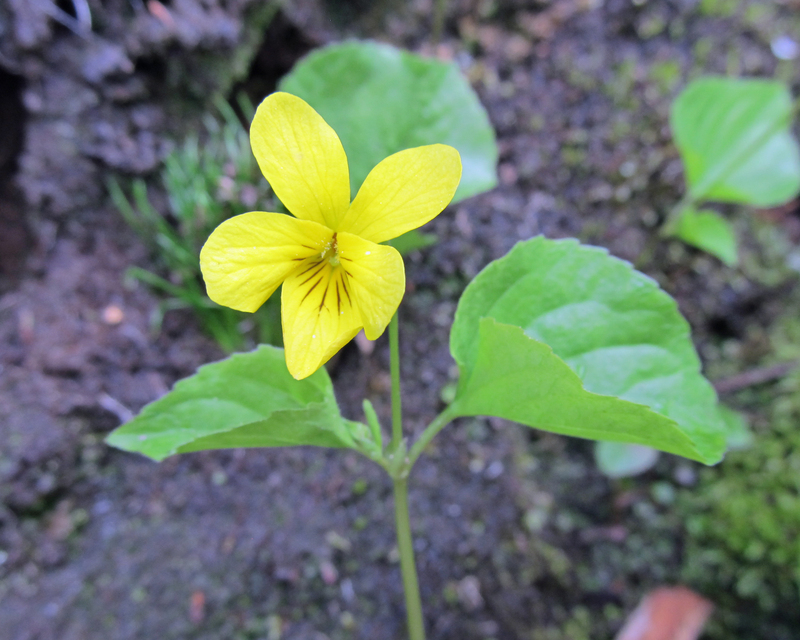 It is an annual dicot that is native to Europe and Asia, but is considered invasive in Canada and the United States. 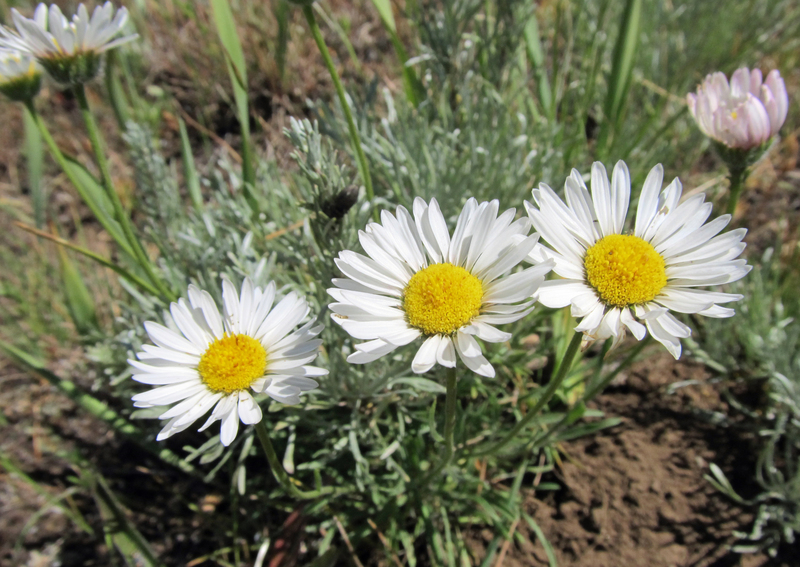 In the U.S., the weed is most common west of the Cascades in the Pacific Northwest. 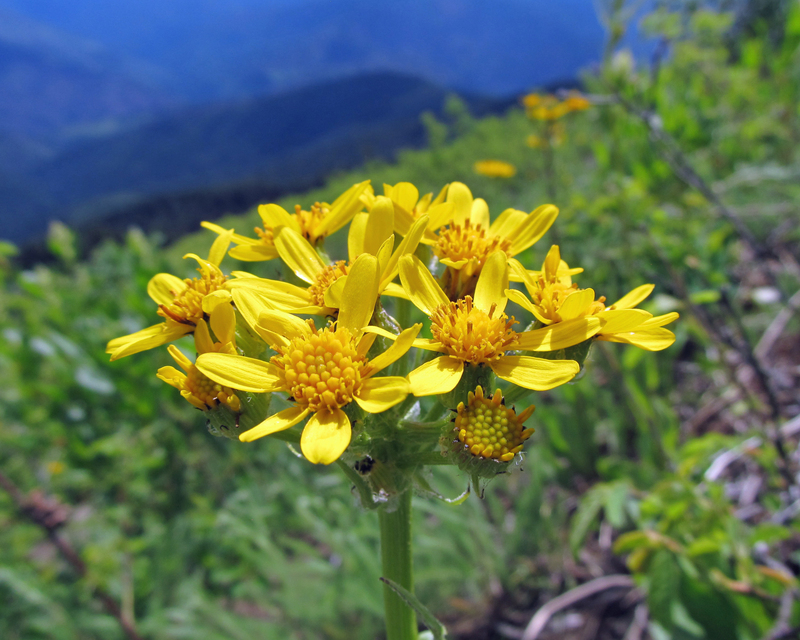 It is in the Asteraceae family (aka the aster, daisy, or sunflower family), and like dandelions or common groundsel, nipplewort is part of the weedy side of the family. 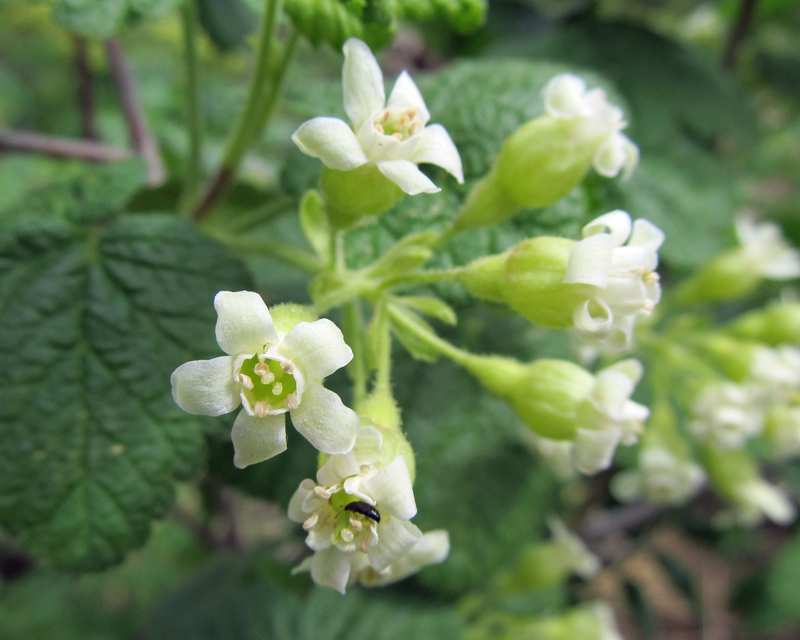 The name itself has an interesting history that originated around 350 years ago when an Englishman by the name of John Parkinson named the plant after he heard that it was useful for topical treatment of ulcers for women on certain areas of their bodies. It was also an herbal treatment for nursing mothers, and was used to aid cows and goats that were having trouble being milked. Another source of the name is said to have come from the shape of the basal lobes and their resembling features. 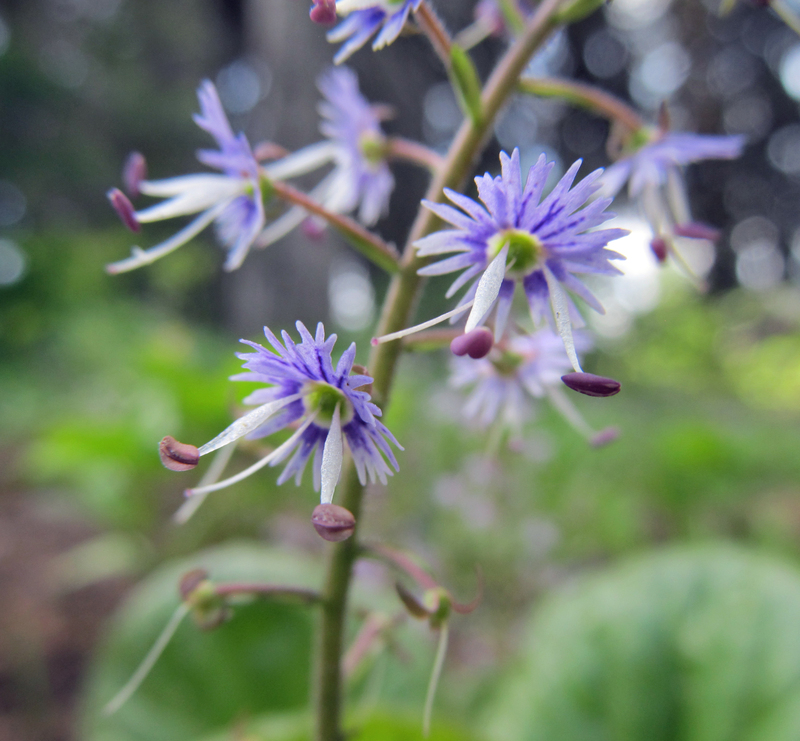 Because nipplewort is edible, its leaves can be cooked like spinach or served raw in only the most hipster of salads. In terms of its anatomy, nipplewort is about one to three and a half inches in height, has alternate, ovular, lobed, rich green leaves, and composite yellow flowers with about 13 petals – similar in resemblance to a dandelion. 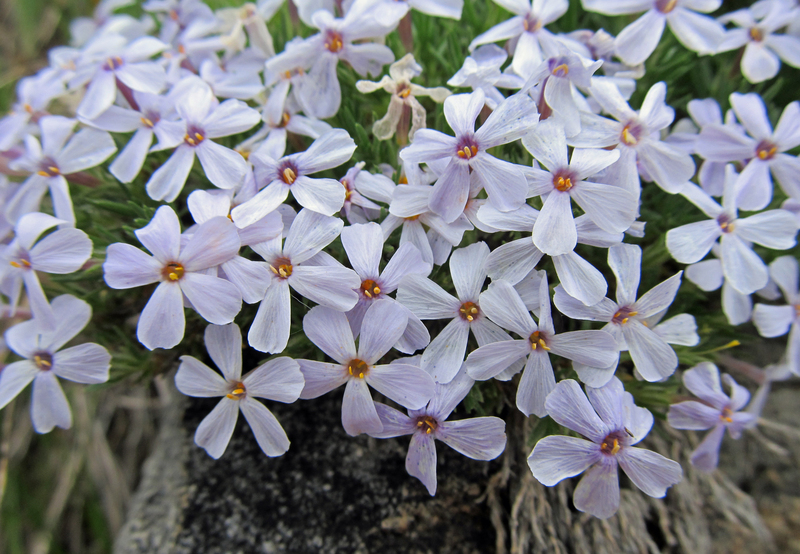 They flower from June to September and are pollinated by various insects. Seed set occurs in July to October. The plant then spreads through reseeding, and one plant can produce 400 to 1,000 seeds that put out shoots in fall and spring. 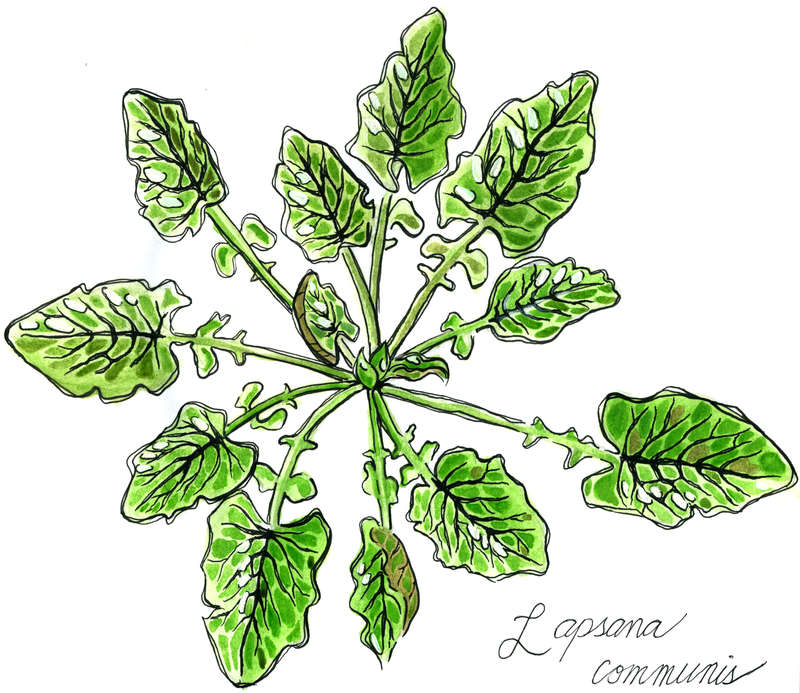 Consult a fellow botanist to find out more about Lapsana communis, especially if you are curious to know if it has invaded your territory. If it has, consider entertaining dinner guests with this unusual plant. 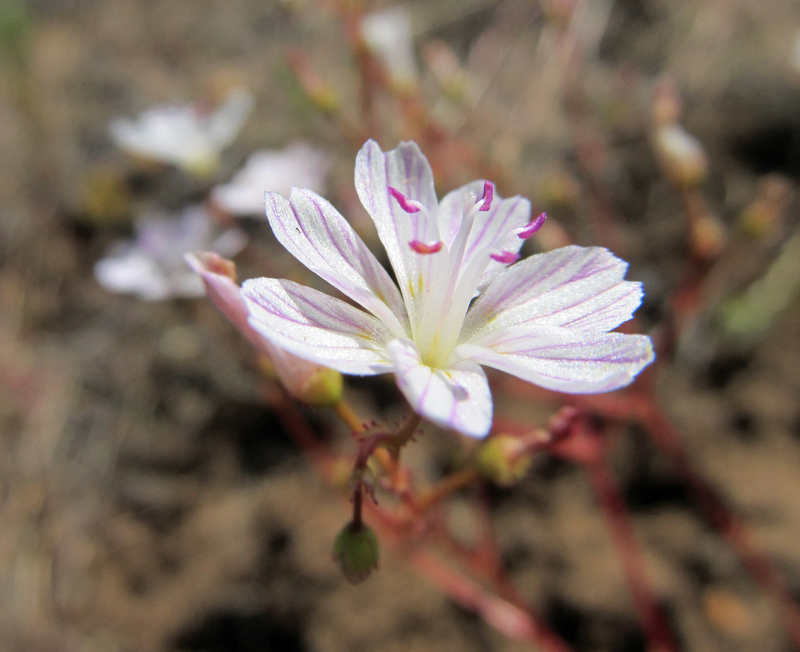 Last weekend I went on two all day field trips that were part of Idaho Native Plant Society‘s annual meeting. The second field trip was in a location with a climate considerably warmer and drier than the first field trip. The flora was much more familiar to me since it was similar to what I generally see in southern Idaho. 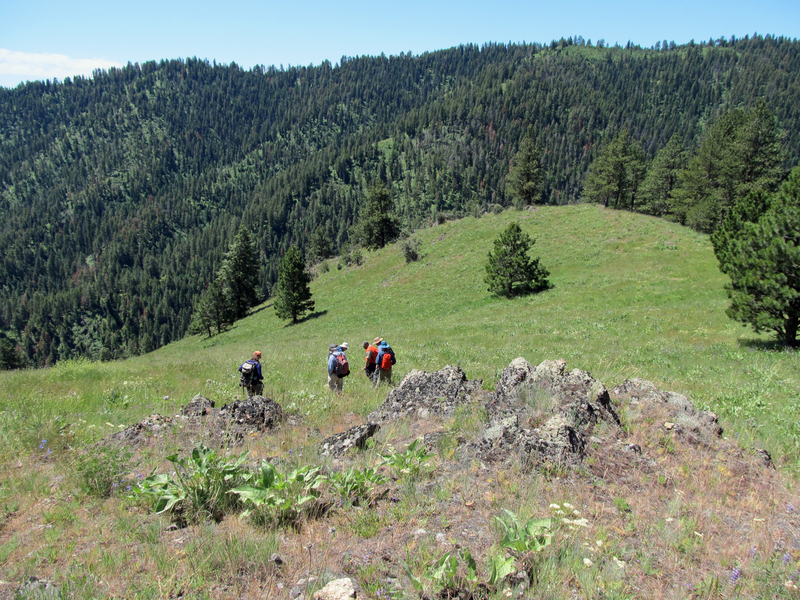 We visited two sites: Mud Springs Ridge and Cow Creek Saddle. 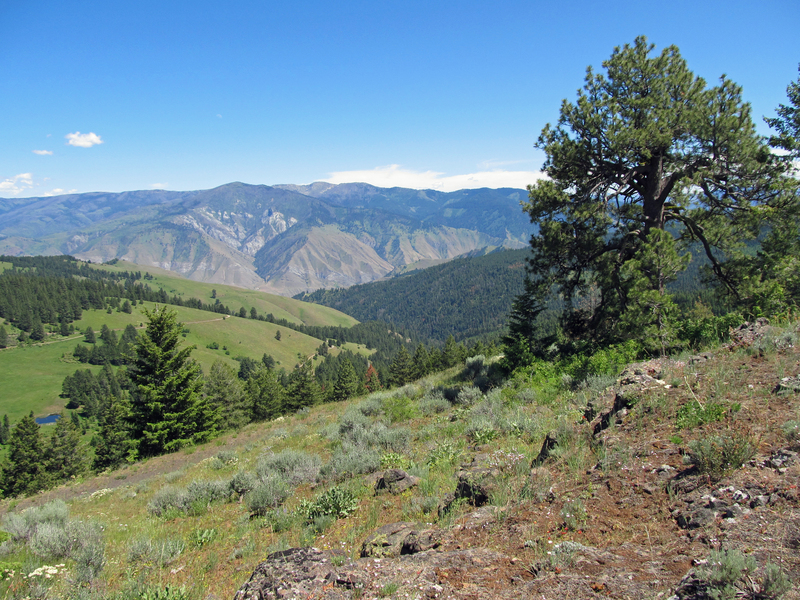 Both are high on a mountain ridge (around 5300 feet in elevation) flanked by the Salmon River canyon on the east and the Snake River canyon on the west. The tiny town of Lucile, Idaho was just below us to the east, and if we would have continued down the other side of the mountain, we would have arrived at Hells Canyon National Recreation Area. 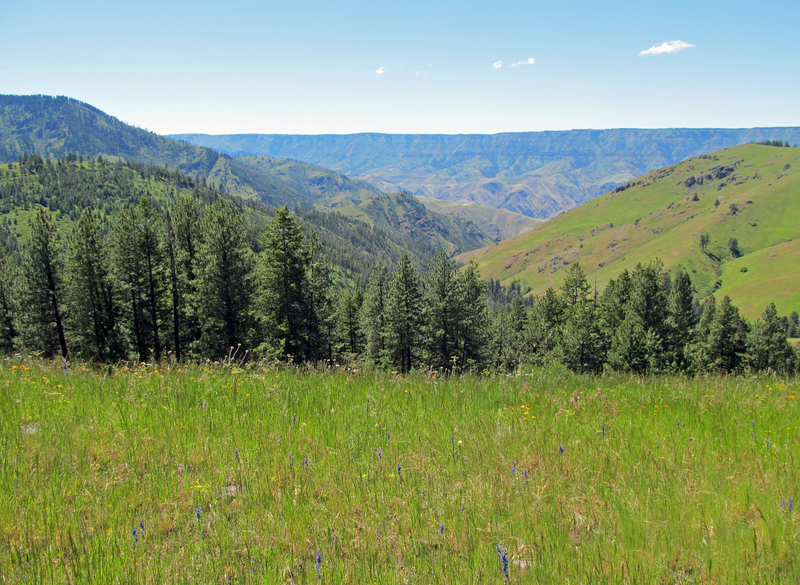 These sites are high elevation grasslands, and there was a huge diversity of grasses and forbs to explore. Taking decent photos of the plants was a challenge as the sun was shining brightly and there was a constant breeze. Photographs don’t quite cut it anyway. The views were incredible. Standing on a ridge top peering across a meadow full of wildflowers with more mountains in the distance. 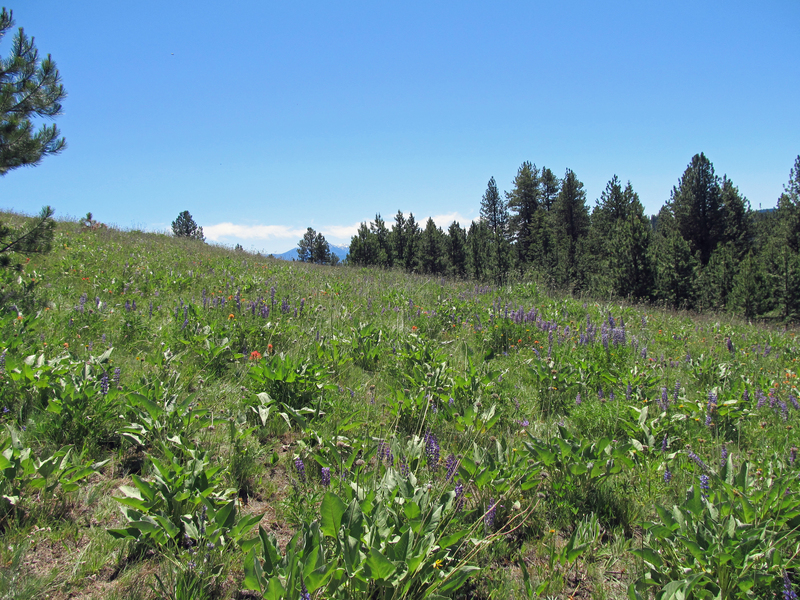 Mass amounts of lupines and paintbrushes mixed with grasses and other plants being tossed about in the breeze. Little rock gardens randomly dispersed across the hillsides. You kind of had to be there. The field trips were incredible, and the annual meeting in general was a lot of fun. If you have a native plant society in your neck of the woods and you are not already a member, I highly recommend checking it out. Now, where to next? I spent this past weekend camping with friends near Grangeville, Idaho. 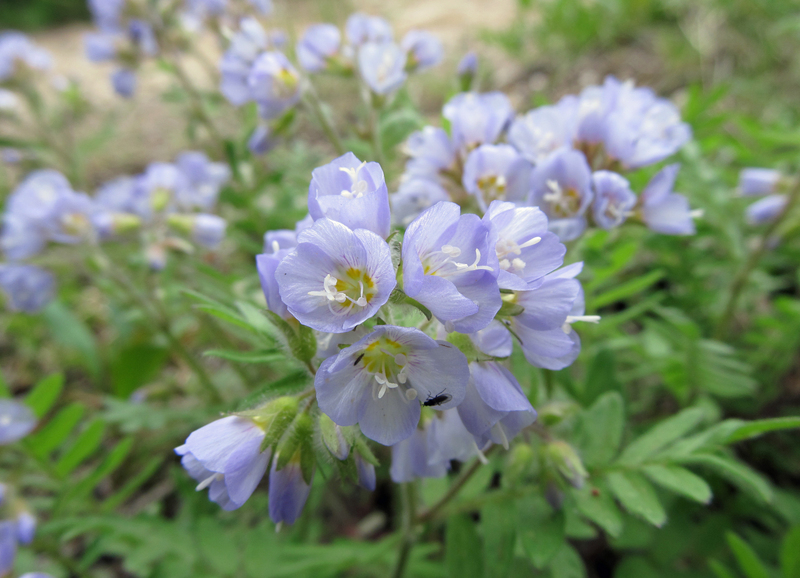 I was attending the annual meeting of the Idaho Native Plant Society. Meetings in the boring sense of the word occurred, but they were brief. The bulk of the weekend consisted of long hikes on guided field trips. 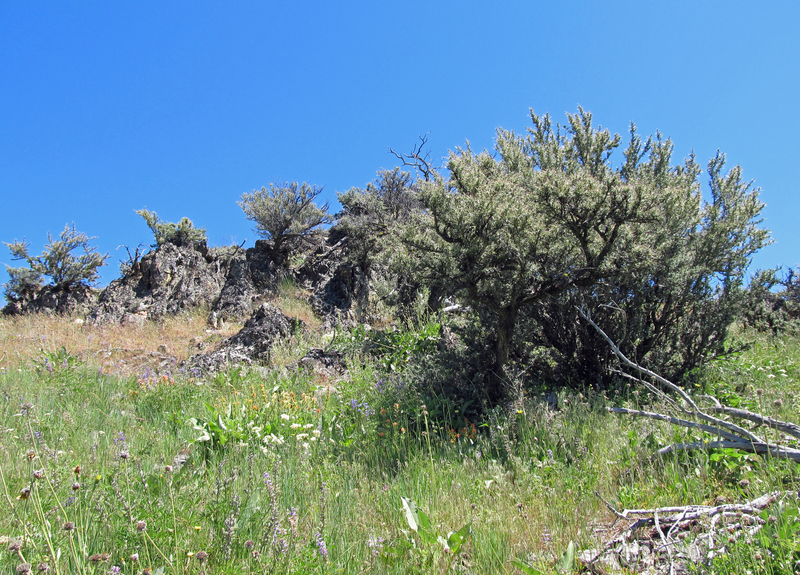 This post is a pictorial tour of a small fraction of the plants I saw on the Coolwater Ridge Lookout trail which is located in the Bitterroot Mountains – my first of two all-day field trips. From where we were hiking we could look down at the canyon where the Selway River was fixing to meet the Lochsa River to form the middle fork of the Clearwater River. This is a part of Idaho that is basically too beautiful for words. At some point I will have more to say about this particular location, but for now here are a handful of semi-decent photos I took while on the hike. A view from Coolwater Ridge. 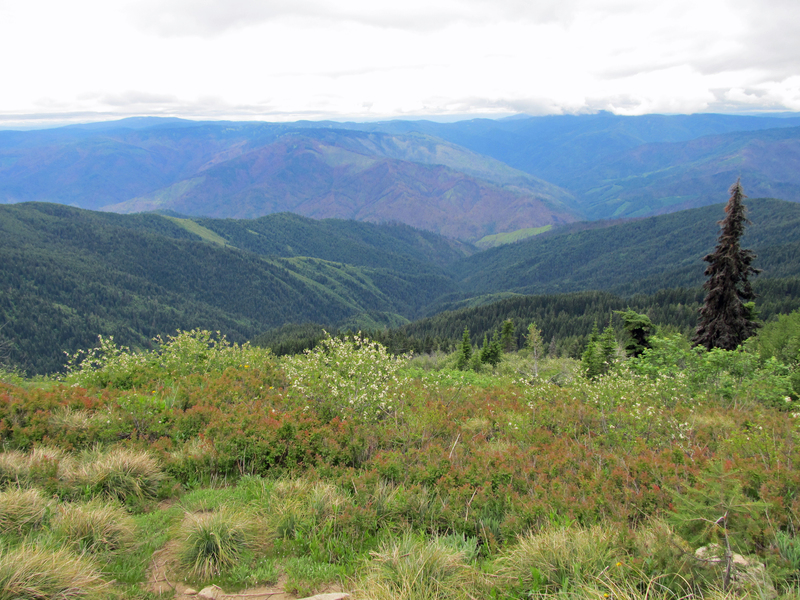 Looking down at the Selway River canyon. Stay tuned for photos from the second of two field trips. In the meantime, go outside and see some nature. 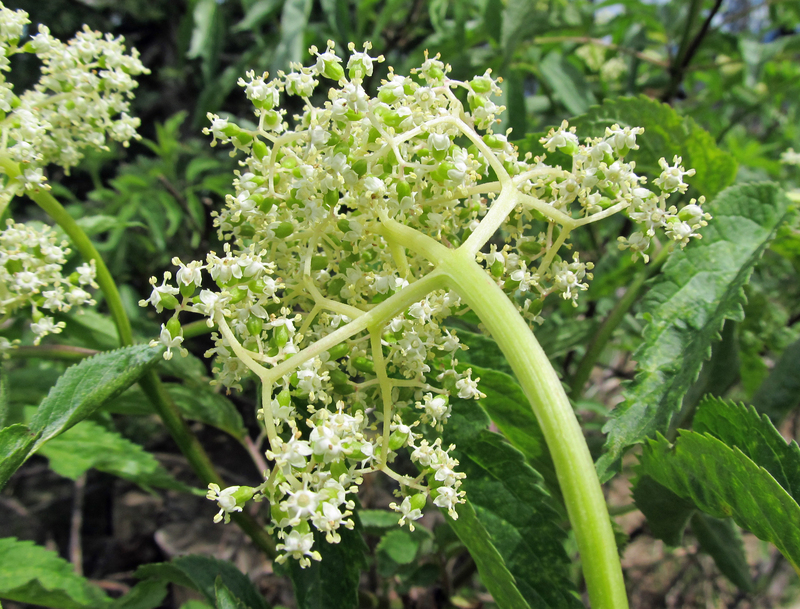 Plants that are otherwise perfectly edible can still find a way to kill you. That seems to be the lesson behind phytobezoars. A bezoar is a mass of organic or inorganic material found trapped in the gastrointestinal tract of animals. Bezoars are categorized according to the material they are composed of, so one composed of indigestible plant material is known as a phytobezoar. After learning about bezoars of all kinds on a recent episode of Sawbones, I decided a post about them was in order. I was particularly intrigued by a very specific type of bezoar known as a diospyrobezoar, a subtype of phytobezoars that can result from eating large quantities of persimmons. The skins of persimmons (Diospyros spp.) are high in tannins. When the tannins mix with stomach acids, a glue-like substance forms and can lead to the creation of a diospyrobezoar. Phytobezoars are the most common type of bezoar and are generally composed of indigestible fibers, such as cellulose, hemicellulose, lignin, and tannins that are found in the skins of fruits and other plant parts. In general, phytobezoars are a rare phenomenon. The risk of obtaining them is higher in people who engage in certain activities (like consuming excessive amounts of high fiber foods or not chewing food properly) or who have certain medical conditions/have undergone certain medical treatments. A study published in 2012 in Case Reports in Gastroenterology describes a specific incident involving the diagnosis and treatment of a diospyrobezoar. [It also includes a great overview of bezoars and phytobezoars if you feel like navigating through the sea of medical jargon]. 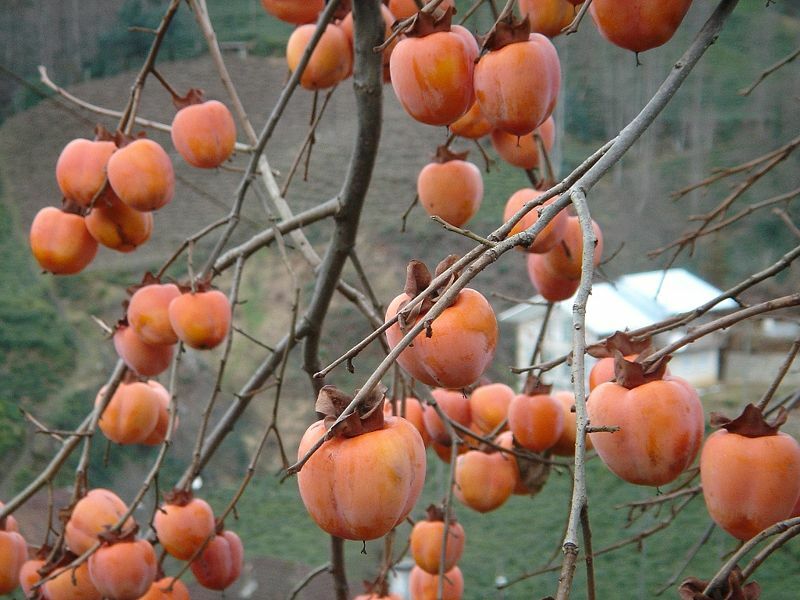 The patient was a diabetic man in his 60’s that reported 5 days of abdominal pain after “massive ingestion of persimmons,” although it is not made clear what is meant by “massive” or “excessive” persimmon ingestion. Fourteen years prior, the patient had “undergone hemigastrectomy and associated truncal vagotomy to treat a chronic duodenal ulcer.” After a series of tests and observations, doctors determined that a large bezoar was lodged in the man’s intestines. Surgery was required to remove it. The recovered diospyrobezoar measured 12 cm x 5 cm and weighed 40 grams. Photos are included in the report if you must see them. The authors of this study cite previous gastric surgery as being commonly associated with diospyrobezoar formation. They also cite previous abdominal surgery and absence of teeth as “predisposing factors.” They list major symptoms of bezoars, which include abdominal pain, bloating, vomiting and nausea, and small bowel obstruction. Phytobezoars most commonly form in the stomach where they can “generate gastric ulcers.” As you might imagine, the situation worsens if the phytobezoar enters the small intestine. Read the study for a more colorful description regarding that. Diospyrobezoars aside, persimmons are beautiful trees with lovely fruit. They are not out to get you any more than any other living organism out there, but their fruit should be consumed with caution. As with anything, the dose makes the poison. In the Sawbones episode, Sydnee McElroy specifically advises listeners to avoid unripe persimmons. That being said, the moral of the story is: if you like persimmons, eat them sparingly and make sure they’re ripe. 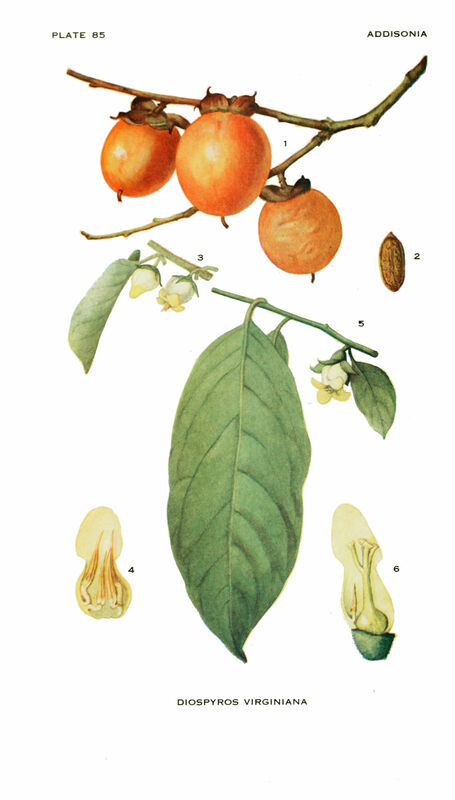 Want to learn more about persimmons and bezoars? Visit persimmonpudding.com for an excellent summary and lots of additional resources. Always on the lookout for more podcasts to listen to, I somehow stumbled upon Native Plant Podcast. I wish I could remember the rabbit hole I went down that brought me to this masterpiece, but I can’t. What I do remember is being hesitant at first. I am all for calling things what they are. A restaurant called “Restaurant?” Why not? A podcast about native plants called “Native Plant Podcast?” Sure. It’s not the most creative name, but it works. What I was worried about, though, was that a podcast calling itself after native plants was going to be preachy, pushy…or just dull. Yet I work with native plants every day(! ), and I love them – so my initial judgement must say more about myself than anything else. Despite my hesitation – and my inclination to judge a podcast by its cover – I gave it a shot. I’m so glad that I did, because what I found was a highly informative show that is simultaneously delightful, fun, goofy, and entertaining. It’s a podcast that doesn’t take itself too seriously. 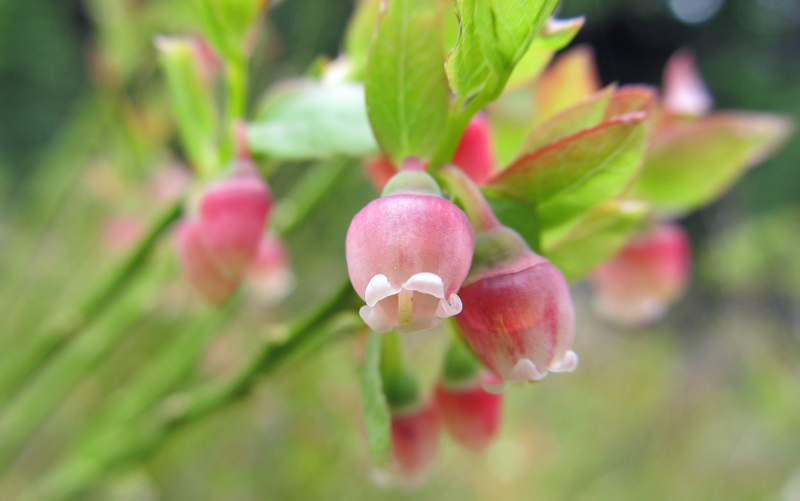 The hosts and their guests share an important message about the benefits of native plant gardening, and they do so with passion and a sense of urgency while remaining lighthearted and approachable. Native Plant Podcast is young. The first episode came out in January 2016. It is run by three individuals that met at the Cullowhee Native Plant Conference in North Carolina (a conference that is often mentioned on the podcast). Mike Berkeley and John Magee are the regular hosts; Jesse Turner mainly operates behind the scenes but makes appearances on a few episodes. They each have their own nursery and/or landscaping businesses that deal largely with native plants. Together they have decades of experience working with native plants. In an episode with Neil Diboll of Prairie Nursery, Mike makes the comment that they “were into native plants before it got cool.” Several of the guests that have been on the podcast so far can say the same thing. One such guest is Miriam Goldberger, owner of Wildflower Farm and author of Taming Wildflowers, who appears on two episodes (part 1 and part 2). Other notable guests include Thomas Rainer, co-outhor of Planting in a Post-Wild World, and David Mizejewski, a naturalist for the National Wildlife Federation. So far all of the guests have been great, and since the the podcast has only been around for a few months, it is easy to catch up on past episodes. As someone who enjoys sitting around talking about plants, this podcast is perfect since much of the “airtime” is taken up by such discussions. The episodes about winter interest and spring gardening are particularly great for this sort of thing. Two other standout episodes are the introductory episode, in which Mike and John discuss how they got started working with native plants, and the episode about defining native plants, in which Mike, John, and Jesse all take a crack at coming up with a definition. 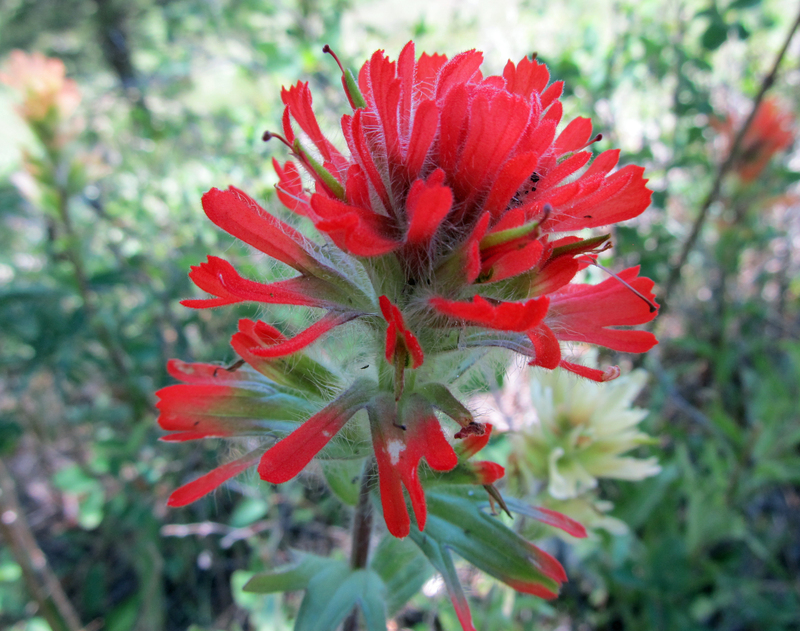 A topic that comes up often on the podcast is native plant cultivars (John understandably cringes each time he hears the portmanteau of “native” and “cultivar”), which seems to be a controversial topic in the native plant world. In each episode of the podcast there is an interview/discussion followed by three short segments: listener questions, stories about dogs or other pets (the hosts really love their dogs), and a toast (in which the hosts pop open their beers in front of the microphone for all to hear). The twitter bio for the Native Plant Podcast sums it up well: “A podcast started by a group of goofballs to highlight the beauty and functionality of native plants in the landscape.” These goofballs really know their stuff, and I highly recommend listening to their show. Everybody says they love Mother Nature, but if you look at people’s yards, very few people actually invite her over. Most people have lawns that are mown to within an inch or two of their lives, and the typical American garden is like a big pile of mulch with a few perennials stuck in it or maybe a few shrubs stuck in it. These are really non-functional gardens from a standpoint of an ecological approach, so bringing your landscaping to life is creating ecological gardens that are not just for the owner of the property, but for all life that you can attract to the land for which you are the steward.